Sonic the Hedgehog is a video game character and the protagonist of the Sonic video game series released by Sega, as well as in numerous spin-off comics, cartoons and books. The first Sonic game was released on June 23, 1991, in order to provide Sega with a mascot to rival Nintendo's flagship character Mario. Since then, Sonic has become one of the world's best-known video game characters, with his series having sold 50 million copies. In 2005, Sonic was one of the first game character inductees into the Walk of Game, alongside Mario and Link. 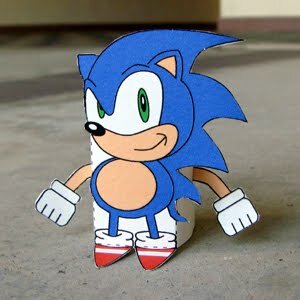 Download the PDF file here and make your own Sonic toy! Find out what's the next toy by visiting our Facebook Fan page. Thanks Jenny, I've linked to your article too.